Triplex plunger pump, available in 4 flows. It has symmetrical power end design featuring top and bottom mounting holes allowing for easy left to right shaft conversion. It has the new generation pressure packing design with an integrated cooling system, orthogonally fitted valves, and splash lubrication. The KT HP Series has i high resistance, light alloy crankcase, Stainless Steel manifold, tapered roller bearings, special anti-friction light alloy connecting rods, forged alloy steel crankshaft, hardened tempered, and nitrided. The plunger guides are cast iron, nickel treated, with solid ceramic plungers, and stainless steel valves. 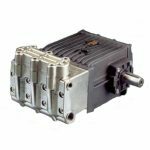 Pratissoli KT HP Series Plunger Pumps Specs.